If you’re dealing with ankle pain, it’s vital that you get to the bottom of the problem so you can heal without worsening the damage. 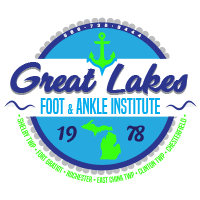 At Great Lakes Foot and Ankle Institute PC in Chesterfield, Clinton Township, Fort Gratiot, East China Township, Shelby Township, and Rochester, Michigan, the experienced podiatry team is ready to help. Book your appointment online or by phone now. An ankle sprain occurs when you put an unusual amount of strain or force on your ankle bones. This often causes the ligaments within your ankle to stretch or tear, as well. Ankle sprains can be painful, and often also cause swelling and bruising. Ankle sprains can make it difficult to walk. An ankle sprain can be fairly mild in some cases, but if you don't get treatment, it could eventually turn into a long-term issue. What is chronic lateral ankle strain? Chronic lateral ankle strain can result from an untreated ankle sprain. If you suffer from chronic lateral ankle strain, you may have the following issues. Chronic lateral ankle strain is usually caused by an ankle sprain, but it can also be caused by arthritis, other joint inflammation, nerve damage, tendon damage, or small bone fractures. In osteochondritis, a small piece of bone below your ankle joint cartilage is damaged, and then it dies because it's not getting enough blood. Once the bone fragment dies, it may break loose, taking a portion of the attached cartilage with it. This can mean serious pain and range-of-motion issues. Usually, osteochondritis occurs after continued stress to your ankle joints. This injury often occurs in active children. Osteochondritis causes ankle pain, often accompanied by swelling. Ankle pain treatment depends on the cause of the pain. Ankle sprain treatment can include rest, ice application, and compression bandages for immobilization. If you have a serious ankle sprain, you may need minor surgery. Your podiatrist can tighten and reattach your ligaments if needed. Treatment usually includes oral medication or injected steroids for pain and swelling. You may need physical therapy to strengthen the ankle-area muscles and to restore your range of motion. Your podiatrist may prescribe compression bandages or a brace, as well. Treatment usually includes immobilization. You may need surgery to extract bone and cartilage fragments. Sometimes, your podiatrist may create small holes in the injured area to stimulate scar tissue growth to fill in the damaged area and to generate fresh blood vessels. Your ankle pain treatment is customized for you. Book your appointment at Great Lakes Foot and Ankle Institute PC online or by phone now.